National Food Day 2014 is this coming Friday, October 24th. Inaugurated several years ago, it is designed, like Earth Day in April, to get us talking about food. After all, it is the one thing we all have in common — the one thing we all cannot live without. Just to confuse you, though, the UN has held International Food Day on October 16th since 1979, but given that neither you nor I ever heard much about this, it made sense to start anew. You’ll find lots of things to do, and more info, at the Food Day website, and read on to learn about some cool stuff happening in New York City that we could easily replicate here. 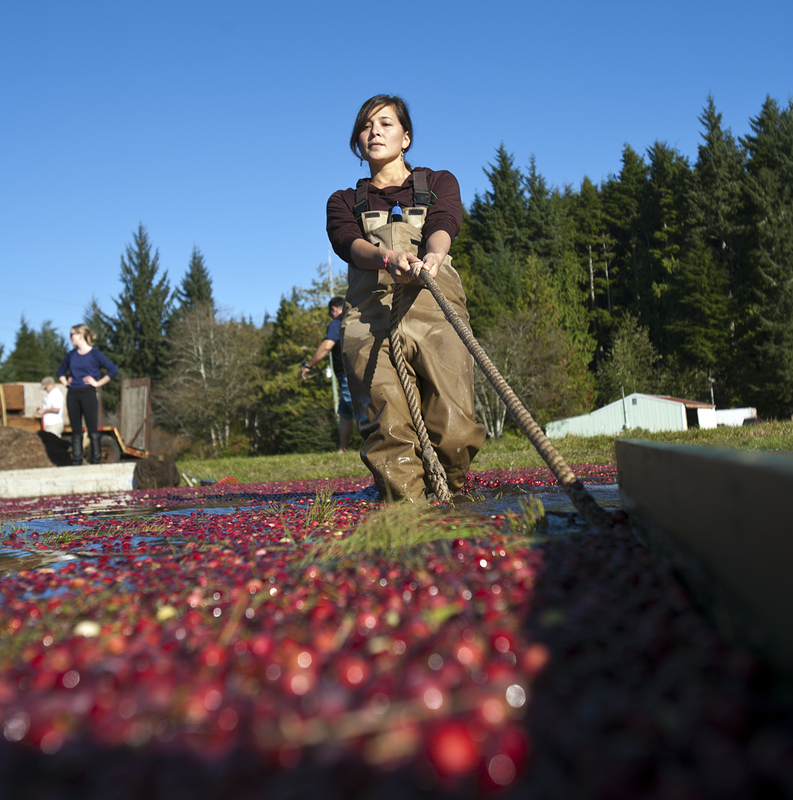 Jessika Tantisook rounding up freshly harvested cranberries at Starvation Alley Farms. Copyright Giles Clement. The New York City Health and Hospitals Corporation (HHC) announced on October 16th the expansion of a program that allows doctors at HHC’s Elmhurst and Bellevue Hospital Centers to write fruit and vegetable “prescriptions” to children who are overweight or obese to help improve access to healthy food and promote overall health and wellness in the community. First adopted by HHC hospitals in the South Bronx and Harlem last summer, the Wholesome Wave Fruit and Vegetable Prescription program (FVRx) proved successful in its first year when the program at HHC Harlem Hospital Center and HHC Lincoln Medical Center helped 40 percent of the enrolled children lower their Body Mass Index (BMI) and more than half of the families reported having more food to eat at home. … HHC selects pediatric patients for FVRx based on age and BMI eligibility. Over the course of four months, during farmers market season, patients receive a “prescription” to eat more fruit and vegetables. The prescription is designed to increase fruit and vegetable consumption for the entire family and is typically valued at $1 per day per household member ($28 per week for a family of four). This year, Wholesome Wave is piloting a $.50 incentive at two of the FVRx hospitals ($14 per week for a family of four). The prescription is exchanged on-site for Health Bucks, a city-wide Department of Health and Mental Hygiene program, which can be used at all New York City farmers markets. Gee, that sounds like something our local government and hospitals could do right here in Seattle in partnership with our farmers market Fresh Bucks Program. And speaking of Fresh Bucks, the program has been extended through the end of December this year, so if you or someone you know receives SNAP benefits (a.k.a., Food Stamps), we will match the SNAP dollars you spend at your Ballard Farmers Market with Fresh Bucks, up to $10, each and every visit! Fresh Bucks can only be used for fresh fruits, vegetables and cut herbs, so use them to stock up on those items, and save your regular SNAP benefits to use for other food items, like eggs, grains, dried beans, honey, meat, pickles and such. Fresh, whole, Puget Sound Keta salmon from Loki Fish at Ballard Farmers Market. Copyright Zachary D. Lyons. The commercial fishing season for Keta salmon on Puget Sound just opened, and that means Loki Fish should have the most local salmon you will ever find here at your Ballard Farmers Market today, as it is caught just a few miles from here in the heart of Puget Sound. Keta salmon used to be considered a trash fish, but in recent years, it has reemerged as a high-quality, affordable, local and wild salmon that also serves to maintain our local fishing economy. It is fresher, better tasting and generally less expensive than farm-raised salmon. It takes well to rubs, smokes and sauces. And unlike most farmed salmon, it is not on drugs and its color is natural. So enjoy some salmon tonight that actually hangs out in the same area code as you do! Lobster mushrooms from Foraged & Found Edibles at your Ballard Farmers Market. Copyright Zachary D. Lyons. This fall has been great for wild lobster mushrooms harvested by Foraged & Found Edibles in the forests of Western Washington. They get their name from their bright red color, and they are a sturdy, earthy mushroom that holds up well when you cook them. They make a great topping for that Keta salmon! As the waters of Hood Canal cool down with fall rains and shorter days, now is the best time of year to enjoy fresh oysters from Hama Hama Oysters. You’ll find a few varieties of live in-the-shell oysters today, ready for you to shuck and slurp, as well as jars of pre-shucked oysters, pickled and smoked oysters, and live clams! These Arkansas Black apples from Tiny’s Organic turn almost black when in storage. It is a firm, tart apple good for fresh eating, cooking, juicing and making hard cider, and it will keep for two to three months. Jack-O-Lantern pumpkins from Stoney Plains Organic Farm at Ballard Farmers Market. Copyright Zachary D. Lyons. We talk a lot about cooking pumpkins here in the blog for your Ballard Farmers Market. There are so many varieties offered by our farmers, after all. But Halloween is less than two weeks away, so let’s talk about carving pumpkins today. Stoney Plains Organic Farm has a nice selection of carving pumpkins for you and the kids to turn into all manner of spooky creations. Pick out the best one for you today, and remember to roast these seeds! Local granola from Marge Granola at Ballard Farmers Market. Copyright Zachary D. Lyons. Cool, dark, often damp fall mornings call for a hardy breakfast, and for that you’ll find great granola in a variety of flavors from Marge Granola. Tall Grass Bakery also makes a great granola, or you can grab some muesli from Daddy’s Muesli. Besides being fine with milk or yogurt, they’re nice just heating up a little hot water, too. 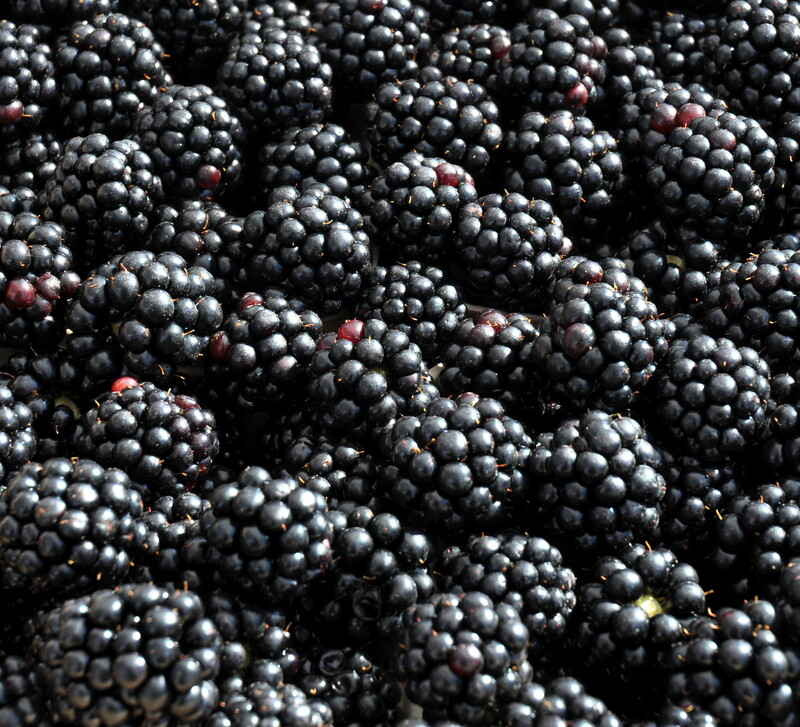 Blackberries from Hayton Farms at Ballard Farmers Market. Copyright Zachary D. Lyons.